Soffits, also known as eaves and fascias often go unnoticed on a home. They do however need to be kept an eye on so that if there is any wear and tear they can be replaced before the damage becomes too serious. Gutters, soffits, and fascias have an extremely important purpose, as they protect the roofline of your home from the external elements. 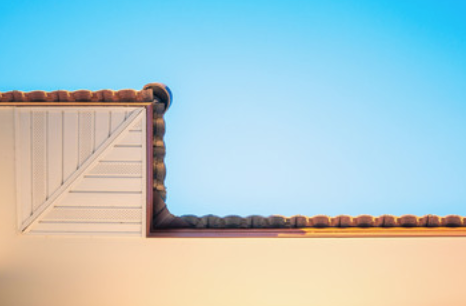 Making sure your soffits and fascias are fitted correctly is essential as if they are not rainwater can build-up, causing damage to the roof of the property so they are used to improve the drainage. We here at GLS Windows have a wealth of knowledge with over 40 years experience in the industry so you can be sure that we will carry out a professional service. Our qualified staff carry out all work quickly and efficiently so that there is minimal disruption to your day to day lives. Soffits and fascias should be installed by professionals to avoid any additional damage occurring to your home in the process. As they are on the outside of your home they are something that passers-by and visitors will see. Making sure they are in good working order and are fitted correctly can affect the outside appearance of your home and your curb appeal. Our fascias come in a range of colours as they quite often match the colour of your guttering to improve appearance. They also come in a range of materials such as vinyl, aluminium and wood. When choosing your fascias you should look at the rest of your house to see what would suit the rest of the fixtures. So if you’re looking for quality installation of fascias and soffits in Northampton or surrounding areas, then make sure GLS Windows are your first port of call. Our friendly and helpful staff will be more than happy to answer any questions or queries you may have. Call us today on 01455 202 985 or contact us via our online form.